With a late October post about how to proceed with kf5 and the announcement of a new stable ISO November 6, last month was skipped for one of these "Early Month" posts. Resuming it again this month. 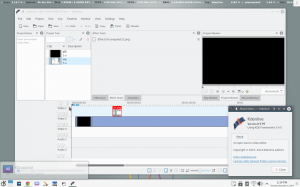 It is a bit of a chaotic situation for packagers regarding KDE, many things are very unclear, so for KaOS, just trying to do the best with the limited info that comes from KDE devs. KDE for all stable users was updated to 4.14.3, with kde-workspace staying at 4.11 (currently 4.11.14), kactivities no more releases for KDE 4. KDE-workspace is supposed to keep getting releases until August 2015, but nothing is posted anywhere for such releases after the November release, see the bottom of the 4.11 release schedule. Frameworks 5 is quite clear how it is released, and is fully stable, so no issues there. And mentioning KDE Applications, there it gets really unclear. First release with the naming scheme of year_month is due next week, 14.12. With all this being so unclear, the goal of moving KaOS fully to kf5 by late February is really taking shape so the focus can go back to just one Desktop Environment, and tons of work toward that has been done the last 4-6 weeks, including the release of KaOS-kf5 2014.12.04 test ISO. Dozens and dozens of early ports have been added to kde-next, many Qt5 builds have been done to get ready as soon as possible for Qt 5.4, Plasma 5.2 will be based on that and (5.2.0 is due to be released early February). Calligra has made a schedule to start their major move to Qt5 in January, then they will use the 1-2 months after that move to try and stabilize all, so it looks like there will be a working Calligra Qt5 version available be late February. The new installer Calamares has seen hundreds of commits over the last one plus month, and is ready for KaOS to be used. Not bug free or fully complete, but the best option available to come with an UEFI ready stable ISO and install. For the rest, the usual updates for this rolling distro have come in at there normal pace. One bigger update to mention is the new toolchain, based on GCC 4.9.2 and glibc 2.20. That new toolchain was delayed somewhat by the major known issues in GCC 4.9.0 and 4.9.1, which made those no candidates for KaOS, see one such comment of the state of gcc 4.9. KCP added a few more functions. Cellix created the option to use bash-completion with kcp, show the full content of KCP with kcp --list-all and --help can show the version.